After two decades, the Uptown bar remains ideal for long, lazy nights among friends. We arrived more or less at the same time, one filtering in after another. Marisa arrived first, stationed herself at the end of the bar, grabbing a few of the last seats in the house. Elspeth, who’d gotten a babysitter for the occasion, arrived third, not five minutes after I’d stashed my coat on brass hooks under the bar top. Conversation began immediately. We hadn’t seen each other in about 10 years—since our 10-year high school reunion. We chatted through the Ginger Man’s ambient sound, people talking and laughing in the dim light, jokes made funnier by beer-induced conviviality. Darts thudded in the corner, wooden chairs scraped against the wooden floor, wooden beams creaked a little as bodies leaned into them—the bar physically a cross between a collegiate pub where people wear school scarves and sing songs, and an old Dallas house made for entertaining. 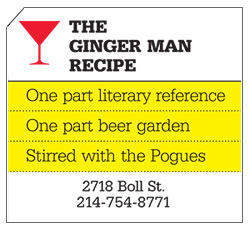 The first Ginger Man was opened in Houston by Bob Precious, a man whose life bore some resemblance to the rapscallion Dangerfield from J.P. Donleavy’s The Ginger Man. The novel is about an American’s adventures and youthful indiscretions while studying at Trinity College, Dublin, and it was banned for obscenity in both the United States and Ireland when it was published in 1955. (For you trivia buffs—and, yes, the Ginger Man has trivia nights—the novel was first published in Paris by the literarily daring French, and a subsequent play by the author inspired hard-living Shane MacGowan’s iconic song “Fairytale of New York.”) There are Ginger Mans now, with various owners, in Plano; Austin; Fort Worth; Norwalk, Connecticut; Greenwich, Connecticut; and New York City. On Boll Street, in Dallas, the TV played and the barkeep pulled pints from dozens and dozens of exotic casks, the clink of glassware a kind of white noise. This may be part of why people speak so revealingly at bars—the wall of white noise, the assumption that no one nearby can hear. Or that no one else cares. Because everyone else—including the Ginger Man’s young couples, the fortysomething men, the groups of Gen Y-ers laughing against each other’s shoulders—was busy caring about their own particular lives. The Ginger Man had been stage to a memorable part of my life. The bar opened in November 1991, a couple of years before I was legally old enough to drink. It wasn’t till later that I hung out there, largely with people I knew from high school. My Belgian friend Julie and her parents (being Belgian, they joined us) and I sat out at the long tables in the garden on summer afternoons and evenings, once listening to the Old 97’s, who hadn’t yet begun to draw large crowds. Sometimes I sat with other pals, during our Duvel summers, reclining into the sofas in the small upstairs, scuffing our feet on the worn carpets, trying to work our way through the entire beer list (an impossibility). The bar hosts fancier events, too—beer tastings and such—but what I remember is languorous summers in the garden, the heat so intense that all the world wilted and our friendships baked solid as brick. The Ginger Man turns 20 this year. My 20-year high school reunion is this month. As I grow up, I find that I learn the same lessons multiple times, in varying ways, and, each time, they sink in a little more. These days, I am recognizing again that strengths and weaknesses are different sides of the same coin. Honorable/righteous; loyal/blind; funny/mean; engaged/nosy; lighthearted/superficial. Few qualities are inherently bad, even ones I tend to be less fond of. Consider superficiality. There’s a place for being superficial, for skimming lightly across the surface like dragonfly wings. Water’s topmost layer contains the limpid sparkle and shimmer, and it’s in the skin of the ocean that we see foam and bubbles, the feathery evidence of power. Most of the time, when I look at waves, I think about the coiling beneath, the physics of distance that mark each wave’s length and travel, the way those deep watery curls are pulled by the moon—the same moon that passes time through my body. Most of the time, this is what I think about and value. And it’s Duvel nights filled with indolent chatter that remind me: you must surface to breathe.